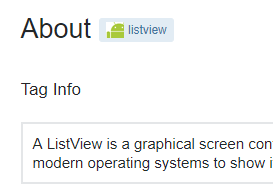 Does Android really sponsor [listview]? Turns out a recently applied synonym is the culprit. This synonym is incorrect and should be removed. Thanks for bringing this to our attention! [listview] having the android icon is indeed a bug; it has been fixed now and we apologize for the confusion. Let us know if this helps clarify things! Not the answer you're looking for? Browse other questions tagged bug status-completed tag-synonyms sponsored-tags . What benefits does a sponsor gain from a sponsored tag? What does data analysis have to do with Angular? Why is the Android icon not appearing next to the Android tag?